I know it has been ages since I posted on here. I've been crazy busy with school! But I know what I want to do next to my Cruze. I want to go all black. I don't want to PlastiDip it so that is out of the question. I want to vinyl wrap it with a non-matte black wrap. I just have some questions I'm having some difficulty finding the answers to. If anyone can answer these, it would be a great help? 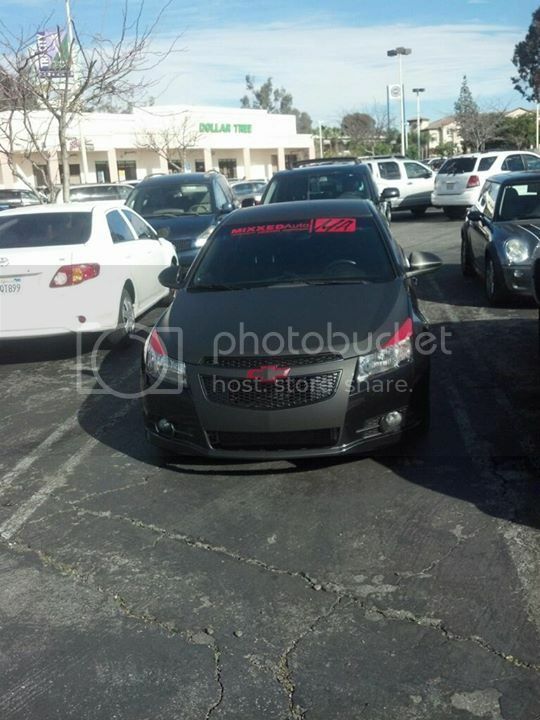 -Has anyone here fully wrapped their Cruze? Did you like it? Pictures? Price? -Brands? I know 3M will probably be the popular vote but they have tons of different kinds? Also, how much would I have to buy? -Is it relatively easy to DIY? -Any reputable Chicagoland shops or freelance guys you know that would do it or help me? I'm looking to do it this summer once the Chicago deep freeze lets up. Last edited by Czaja25; 02-27-2014 at 01:51 PM. Yes, 3M 1080 series is the best. It has the most stick without lifting. I tried other brands ... but I would stick with 3M for longevity. DIY??? Its actually kinda fun stuff but I recommend you watch some vids on youtube to get an idea of how it works. Once you get the hang of it.. heat(heat gun), pull, stretch, press down. The great thing about that stuff is... you can easily pull it off and or redo... Here in Cali it gets HOT! So ive been told that only carbon fiber type should be used on the roof ...otherwise it might lift....I did consider it but think I'll hang with what I have done which is difuser, trunk wing thing, the chrome piece just below the trunk, side markers, front spoiler under the grille. 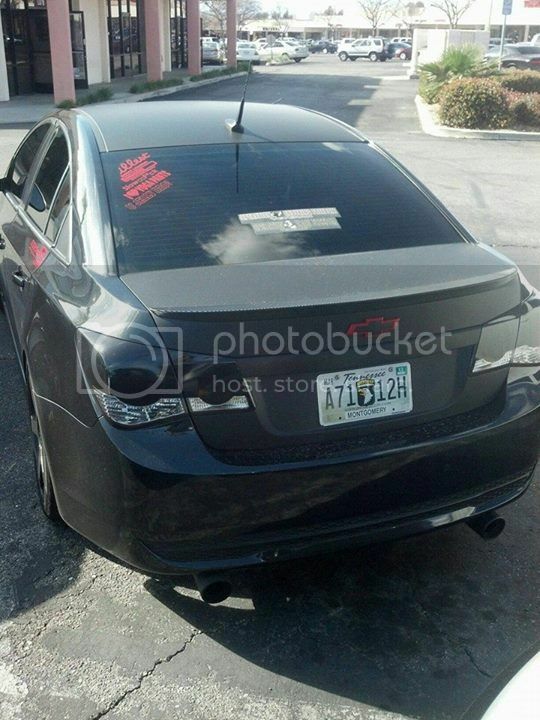 I'm planning on having my entire Cruze wrapped in the next month or two. You need a lot of vinyl, I would have to double check, but approximately 80'x5' sheet will cover it. You want to do each section of the car separate in order to get proper wrap around. So no trying to use one big sheet for your doors and side of the car, there's not enough material to tuck, and with the amount of stretch you have to put on the vinyl it will peel up at the edges. In terms o doing it yourself I would STRONGLY urge you to take it to a shop who knows what they're doing. Bumpers are extremely hard to do, and even a professional can mess up on a bumper and have to cut a new piece of vinyl to re-do it. You do not have an unlimited amount of pull of and re-dos with vinyl, as if you keep pulling it off to stretch it, you will eventually out stretch the vinyl, and even if you can get it on the car, after a day of sitting in the sun it will peel back up due to the amount of stretch pressure you have on the material. Carbon fiber IS NOT the only type that can go on the roof of your car, and anyone who says differently is a complete idiot. Vinyl is vinyl, it can go on any part of your car, regardless of heat. Last edited by Smurfenstein; 02-27-2014 at 06:34 PM. I drive through that area on 294 every few weeks. I could set some time this spring to help you. I havnt done a full wrap but I've done tint and vinyl stripes for several years now so I know what im doing. 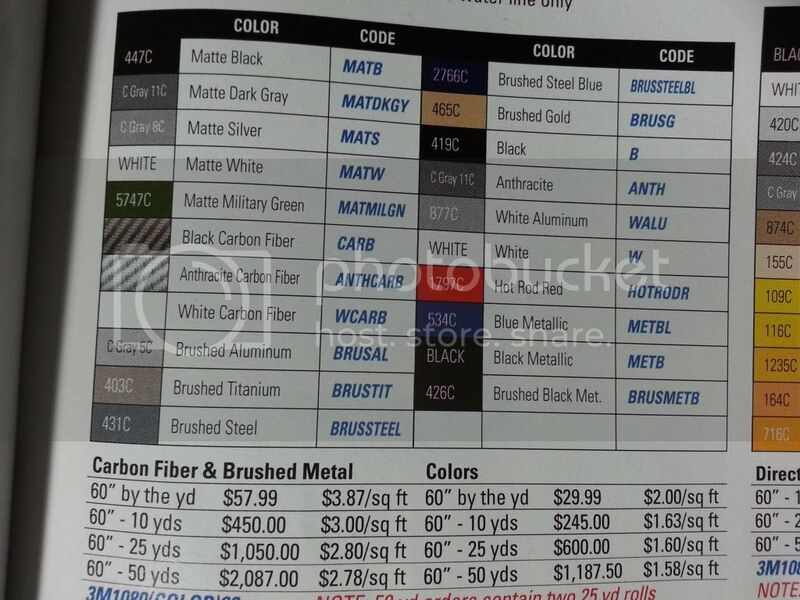 Here is the list of colors of 1080. I believe you will need 25 yards. The pic shows that will cost $600 but I have a 3M rep that can probably get it to me for $550. as for difficulty. Wraps are so so so much easier with 2 people. I would say only experts could handle a wrap single handed. Ever consider having the car plastidipped?? From what I can gather, it's cheaper and easier to remove. There's no glue left on the vehicle and doesn't harm the paint. In his main post he states that he doesn't want to use plastidip. Even though its cheaper it can come out b lotchy if yoh don't know what you're doing. Thanks everyone for the help! I'm sending emails to different Chicago shops and getting quotes and it is looking good. I'm shooting to have it done by the end of the summer. And I also decided I'm not going to do it by myself. I have never worked extensively with vinyl and would rather not have this be my first experience-- no matter how many "re-dos" you get with the vinyl. Any further help would be greatly appreciated! Yeah, like Smurf said, I only want to use PD on small areas like I have in the past (bowties, chrome trim, spoiler, etc.) Thanks for your response though. Are those prices from Fellers by any chance? I requested their catalog and I got it today. For 25 yards, they ask $621. But here is the thing, a while back I bought a roll of black film online for my roof and never put it on. I was thinking of cutting the price somewhat by having someone do my roof with my vinyl then a month or so later buy less 3M vinyl, just enough for everything but the roof. Do you think that would be wise? Thanks for the great response man! Yeah doing it myself really scares me after further research. But if you read my response above, do you think that would smart to do or no? I was thinking I can pay the guy who did my windows to do my roof for cheap, then buy only maybe 20 yards or so of the 1080 vinyl for everything else? Also, your buddies cruze looks sweet man! Love the front bumper and the red accents. Ohh okay. Another thing I just thought about was how much do you think I'd need for the trunk, hood, and the middle of the front bumper like in the pictures of the black cruze above? I was thinking I could split it like that too. Do those sections and then later finish it. Would that be cheaper?